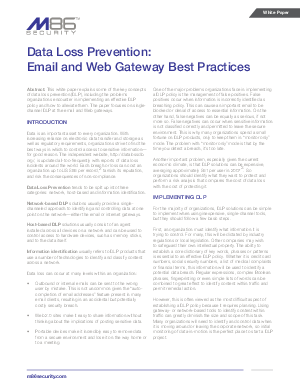 This white paper explains some of the key concepts of data loss prevention (DLP), including the problems organizations encounter in implementing an effective DLP policy and how to alleviate them. The paper focuses on single-channel DLP at the email and Web gateways. Data is an important asset to every organization. With increasing reliance on electronic data transfer and storage as well as regulatory requirements, organizations strive to find the best ways in which to control access to sensitive information—for good reason. The independent website, http://datalossdb.org/, is updated all-too-frequently with reports of data loss incidents around the world. Each breach or loss can cost an organization up to US $86 per record,tarnish its reputation, and risk the consequences of non-compliance.